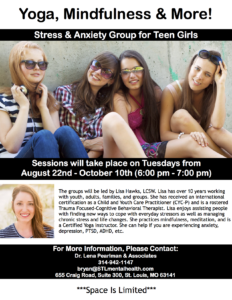 Dr. Lena Pearlman & Associates will be starting a new teen girls group for stress and anxiety in August – “Yoga, Mindfulness & More”. The group will be led by therapist – Lisa Hawks, LCSW and will take place on Tuesdays from 6:00 pm – 7:00 pm beginning on 8/22. Lisa’s bio is available at: www.STLmentalhealth.com/our-team. Please contact – Dr. Bryan Pearlman for more information at: 314-942-1147 or bryan@stlmentalhealth.com.